The New York Times today announced that it is launching a package of digital subscriptions for access to its content, specifically revealing that it has agreed to Apple's in app subscription program that allows customers to subscribe via their iTunes Store account with Apple taking a 30% cut of revenue. The new subscription options launch on March 28th, with the one-click iTunes Store options for subscribing within iPhone and iPad apps coming available by June 30th. The subscription plan allows for free access to a set amount of content across digital platforms. When the monthly reading limit is reached, users who are not already home delivery subscribers will be asked to become digital subscribers. Digital subscriptions will be available in the United States and globally on March 28, 2011. The Times is launching digital subscriptions in the Canadian market beginning today in order to fine-tune the customer experience prior to the global launch. For non-home delivery subscribers, the basic package - NYTimes.com plus Smartphone App - will start at $15 every four weeks. 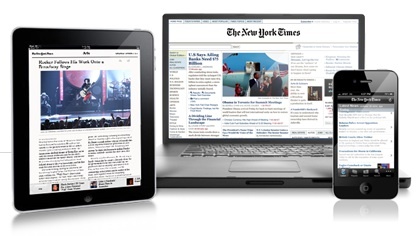 Standard digital pricing is set at $15 per four-week period for full access to NYTimes.com and access through a smartphone app such as on the iPhone. Those seeking to pair NYTimes.com access with iPad app access will be charged $20 per four-week period, while those wishing to have complete access across NYTimes.com, iPhone and iPad will be charged $35 per four-week period. Introductory pricing specials will be available at the service's launch. The New York Times will also offer individuals free access to up to 20 articles per month, and users directed to articles from search results, blog links, and social media will be able to access those articles in their entirety free of charge even if they've reached their monthly limit for free content. The "Top News" section of smartphone and tablet apps will remain free of charge at all times, and subscribers to the print edition of The New York Times will have free access to all digital content.